Corina Sutter is Director, Government and Regulatory Affairs at RMS, and is based in London. She joined fellow employees from RMS and RMS clients on our annual Impact Trek in Nepal during March this year. This is Corina’s account of her time in Nepal. When you think about strengthening a building to make it more resilient to seismic events, does “retrofitting” come top of mind? And if you have heard of retrofitting, do you know why it is more cost-effective and in many instances more suitable than simply rebuilding? 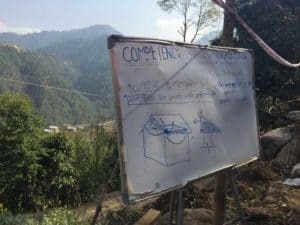 This awareness challenge is what Build Change faces in Nepal; with regards to retrofitting not everyone is aware or convinced — yet. Thanks to RMS and their partnership with Build Change, I had the fantastic opportunity to spend a few days with their team in Nepal to learn more about their local initiatives. Prior to the trip, I thought I had a fairly good understanding of Build Change’s way of working and their impact on societies within which they operate, and was looking forward to better understanding what particular emphasis and challenges they see in the context of Nepal’s socioeconomic and political environment. After a week with Build Change on the ground and many hours spent in conversation with their project managers, field engineers, and architects, I came to realize that their approach to improving building practices in disaster-prone and low-income societies is much more nuanced and complex than designing and implementing safe building standards. Of equal importance for a grassroots organization such as Build Change is to take the political, socioeconomic, cultural and geographical landscape into account when looking to change and influence local building practices, both in direct work with homeowners as well as at the government and policy level. The main thing I had not fully appreciated before the trek was Build Change’s pursuit in Nepal to advocate for retrofitting damaged structures versus completely rebuilding new homes, where it makes sense to do so. The latter is naturally the only choice where buildings have entirely collapsed following the earthquake. Build Change have spent invaluable time designing a whole catalog of standard building designs that fit a variety of needs specific to family size, cultural background, accessibility, resources available, etc. and can be erected in a short amount of time and at minimal cost. 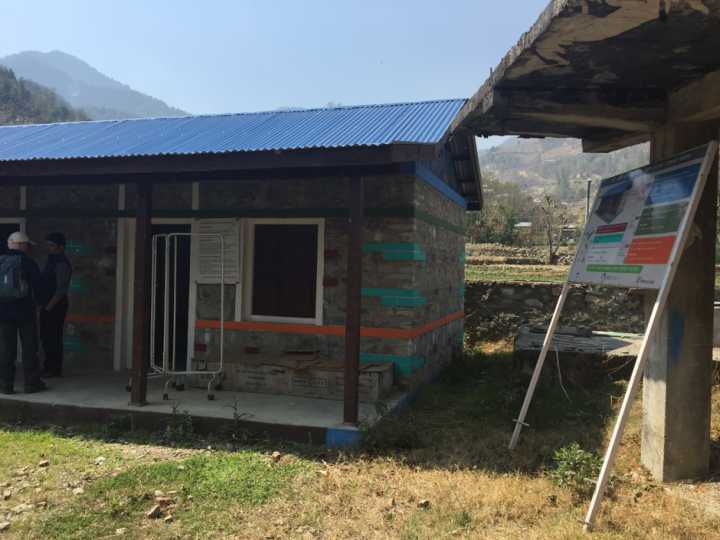 But as an alternative to new builds, some damaged buildings can be “saved” and retrofitted —repaired as well as enhanced with regards to their stability and hence able to withstand local natural hazards such as earthquakes in Nepal. Due to the variability in damage as well as the construction and layout of individual houses, this approach can be more complex and certainly harder to standardize, yet it is often the most cost-effective solution compared to completely rebuilding a new home, especially when taking the size of a building into account. We met a lovely couple who were excited to show us their home (shown in the picture above) who are just one of the families that Build Change has supported with a retrofit of their home, and they could not be happier with the result. The earthquake struck during the day, and they recalled how they were luckily sitting outside their house as it happened. No-one was hurt. 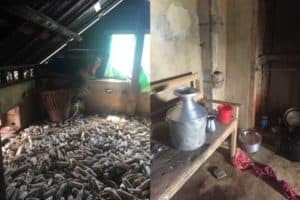 Their married daughters no longer live in their home. Their cows lived in a newly build shed next to the house and were unscathed, but their house suffered heavy cracking from the shaking. Had they used the government grant provided to those impacted by the 2015 earthquake to build a new home, the money would have barely sufficed to build a small new house with one or two rooms. 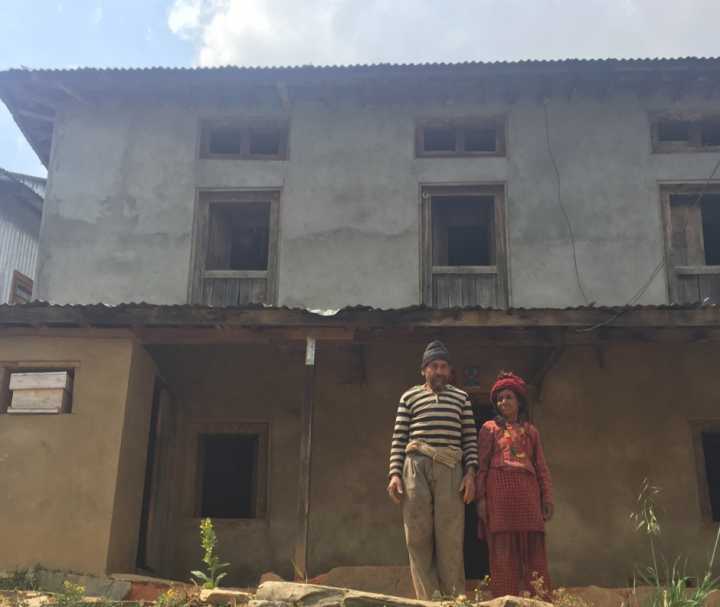 By retrofitting their damaged house instead, they are able to continue living in their traditional two-and-a-half story family home that housed the family for several generations and fits the daily needs of both the family and their livestock. A typical Nepali house in the areas we visited usually comprise of three floors — a kitchen and sometimes animals were held on the ground floor, bedrooms on the first floor, and grain storage in the attic. Retrofitting is often much more cost-efficient than rebuilding from scratch and more importantly leaves families with the room needed to continue to support their lives and often their family business. More strikingly, it means a family will actually live in a house that is much less likely to collapse and cause loss of life in a future earthquake. This is because many families that qualify for a government subsidy to build a new home, end up building a smaller structure next to their damaged house, which often just provides shelter to their cattle due to its limited size, while the family continues to reside in their large but damaged and unsafe home beside it. The situation of our hospitable couple is not unique in Nepal. There are hundreds of thousands of families that would benefit from retrofitting their home, but the practice is not well understood, difficult to standardize, and last but not least, not always appreciated by local engineers. In comparison to a perfect new build, the stability of a retrofitted home may be considered slightly inferior. But in the context of the aim to avoid loss of life, a house need not necessarily be judged by the degree of possible damage, but by its ability to likely remain above a certain threshold of damage that will avoid the loss of life. This perspective changes the cost-benefit of retrofit versus new build, and when taking a homeowner’s situation holistically into account as mentioned above, retrofitting will often come out on top. But it can only be appreciated and adopted as a solution if well enough understood both by the local homeowners, builders, and engineers. In order to tackle this issue, Build Change is setting up retrofitting training programs. Retrofitting takes more expertise than building pre-designed houses and it can be hard to convince engineers to sign off on retrofit because the quality is technically slightly less than a new design. But retrofit can be much more appropriate in the overall context and in cost-benefit terms. In the pursuit of enabling the local workforce to own building practices, Build Change is first set to educate the local population about the benefits of retrofitting in order to gain acceptance for the solution by homeowners as well as attracting local builders and engineers to adopt and continue to advocate for the new practice. A brand new training site is currently being established. 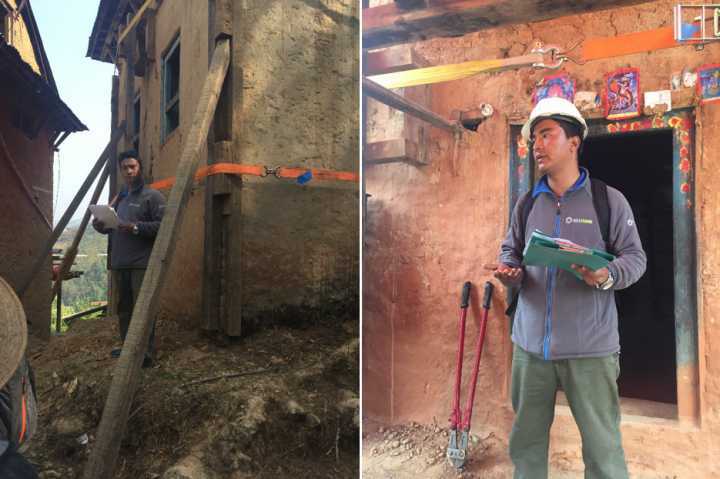 On the practical example of a house that could be retrofitted, local trainees get to learn and practically apply new skills on a module-based learning program. Build Change is now paying builders to train if they have to take time out time of their day job. Once complete, they are equipped to take Build Change’s advised practices forward and eventually train others in what will hopefully turn out to be a “snowball-like” effect so local communities can proactively own their approach to safe building practices now and in the future. Farther into the Himalayas, the geographical distances present additional logistical complexities. No roads meant no access for help after the earthquake, and houses were often already completely rebuilt by the time an organization such as Build Change could arrive. This meant that they were not rebuilt using improved earthquake-resistant designs. Getting access to materials required for more stable homes can be a challenge for villages with no road access. Imagine how to transport rebar if goods are transported by foot as shown below. During some time spent trekking the Himalayas after the Impact Trek, the amount of insight gained the week before became ever the more apparent. I will not look at buildings the same way anymore. In the remote mountain villages where houses mostly fully collapsed, they were rebuilt immediately by stacking stones on top of each other. The most notable change from before were seen on the roofs, still temporary and noisy due to a lack of insulation. Finally, in one particular town that I came across, the town had not only lost all of its houses during the earthquake but also its main source of income. Tutopani, a small town in the Tamang region close to the Tibetan border and well known for their hot springs, immediately struck me with its colorful and more up-to-date houses and a large number of comparatively comfortable guest houses compared to neighboring villages. But sadly, the source of their economic wellbeing has literally dried up due to the earthquake. Though it seems this phenomenon is not limited to Tibet, the villagers keep praying and digging, hoping to rediscover the well.